Today I went to Corpus Christi to judge pierogi. One thing I learned is that it is one pierog, two pierogi. From now on I will say that correctly! People were filling me on on that situation with the priest that I wrote about yesterday. It appears that there was, ahem, a lot I did not know, let me just say that. My heart goes out to the good people of Corpus Christi. My prayers go out to priests. And so on to other important matters. Such as the peck of peppers that I picked, zut alors. 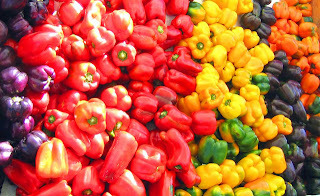 Besides judging pierogi I went to the Clinton-Bailey Market and there was this truckload, honest, of peppers I could not resist. For $4. I bought them. And that farmer I bought them from, he had this funny look on his face. You know how in "Deliverance," there is that brief interlude of levity when the one guy plays the banjo duet with the guy on the porch? This farmer had the weird inscrutable look that the guy on the porch has at the end of the banjo duet. When I got home I realized why. There were about a thousand peppers in this box! That is a picture I took of them up above. Here is what I have done so far. I made a kind of dip you make by roasting eggplant and peppers in the oven -- that used up an eggplant too. Then I made peperonata. That is peppers fried up with onions and tomatoes. It is great on pizza or pasta, Howard and I just ate it South Beach style with chicken off the grill. Yum! See those three green peppers in the picture? I gave them to my mother. She likes the green peppers. So I got off to a good start. I am maybe a third of the way through these peppers? Like I need a project like this, you know? My Pennario project is not keeping me busy enough. Oh, that reminds me. My mom and I went to one (1) garage sale. We were limited to one because also my mother had to go to Walgreen's. That is a tale in itself. But this garage sale, it was my Facebook friend Jerry and his wife, Michelle. When we walked up the driveway Jerry came out and said: "You know what, I had two rare Leonard Pennario records but we sold them!" Jerry will have his little joke! Also I love how I have half the people in Buffalo not only knowing Pennario's name, but pronouncing it right. It encourages me as I go forward!